I wrote a blog a while ago about the herb called lovage. https://sarasinart.net/2013/04/25/lovage/ It’s such an interesting plant, and one that many people don’t know about at all. The celery seed you add to your food actually comes from lovage. I dry some of it and use a different method than the way I dry sage. 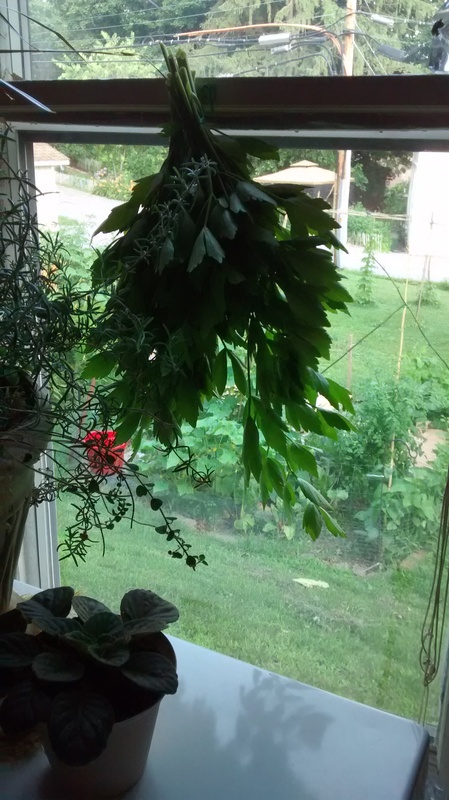 One blog reader asked whether I would dry any herb the way I described taking the leaves off of sage to dry it, but I wouldn’t with most herbs. 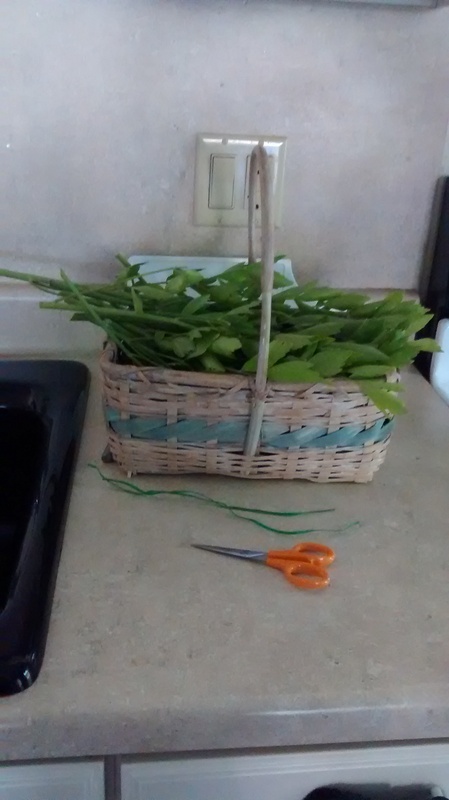 https://sarasinart.net/2015/06/29/drying-sage/ I take the leaves off of the sage to dry them separate from the stems because the leaves of sage are large and it’s not a plant with such a high water content as some others. The leaves dry well laying out on a flat surface. Drying smaller leafed plants like rosemary and thyme, for instance, is done by tying the herb in bundles since the leaves are so small and you’d take all day to take the leaves off. Once those herbs are dried in bundles, it’s very easy to crumble the leaves away from the stems. Lovage has a high water content; it’s much juicier than sage, for instance. So, even tho these leaves are large like sage leaves, laying the leaves of it out flat doesn’t allow them to dry so easily and mold could start to form before the leaves dry. It’s better hung in bundles in a sunny window like many other herbs. Once the leaves are dry, then if you hold the bundle over a big surface like a cookie sheet and crumble the leaves, the flakes of dried leaves come off the stems and fall onto the cookie sheet and you can gather them and put them in a jar. I hope it makes sense why most herbs are dried in bundles and something like sage can be, but is one that will dry quicker if you separate the leaves from the stems. These bundles of lovage are hanging beside a pot of rosemary and oregano growing in my kitchen. I like them so much I need a pot of them in the house to cook with in the winter. Out that window is my rambly fenced in area, with a big bamboo tee pee to let black eyed peas climb up on. Oh how I love to grow food, as much as I can, as long as I can! Thanks Jackie. I didn’t explain it well enough in the first post.